> Install outside safety lighting, PP > 2-3, 1-2 hours still needed, (WD) Work in progress, almost finished. Following is a list of projects which have been completed to improve the quality of the Post 501 facilities, used both by fellow legionnaires, and also open to the public. We want to express our fullest appreciation to those folks who put in their time and sweat labor to get these projects completed, especially under the guidance of Legionnaire Rich Ruland, former 2nd Vice, and now Jerry Schultz, our current Post 2nd Vice. > Pantry (required by city code) now opened up off kitchen. Thanks to the three person wrecking crew (Jerry, Rich and Commander) that got this one done. > Two new stainless steel centeral tables along with a back stainless table has been added to the kitchen, replacing the temporary folding tables. The work surface is enhanced, stronger, and easier to keep clean. > Lights installed in the new drop ceiling in the Auxiliary/History room > COMPLETED ! > Electrical outlets in History/Auxiliary Room > ALMOST COMPLETED, ONE OR TWO MORE DROP LINES STILL NEEDED ! > Fence to enhance appearance of north side outside of Post > COMPLETED ! > New steel security door installed on street (west) side of Legion Hall > COMPLETED ! > New door handle on bathroom now installed, so one should now not get locked in ! > Install Air Conditioner in renter's workspace > COMPLETED ! > Rebuilt the outside door for the renter's operation > COMPLETED ! Mike, Tom, Carl & Bill taking a work break during the painting - 6-11-2019. Mike & Tom painting, Carl & Bill supervising - 6-11-2018. Bill, Jerry, Keith & Tom priming west side of Post 501 - 6-5-2018. Romeo priming north side of Post 501 - 6-6-2018. Rebecca, Keith & Bill priming east side of Post 501 - 6-6-2018. As you can see, we now have some of the monies needed in hand. We just need your physical help. Let us know if you have the time or inclination to assist in any of these projects: phone post HQ or use the “CONTACT US” page below. 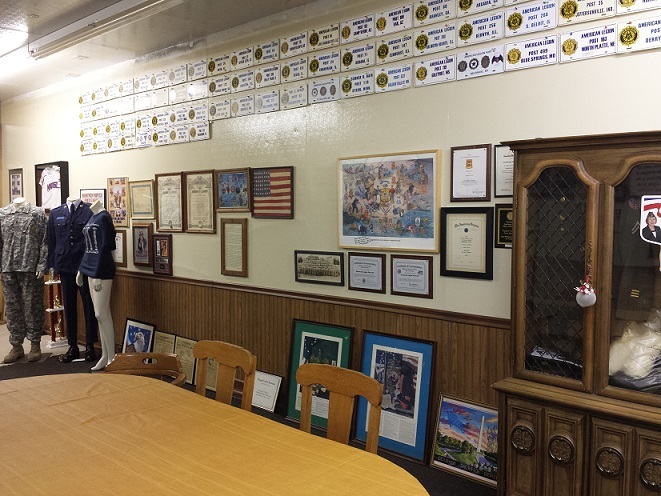 Last ceiling tile installed in Legion Post 501’s Auxiliary/History Room on 11-26-2018. Legionnaires Keith & Jerry assisted our Naval CB’s, Dan & Gene, the prime installers of this new ceiling, along with Rich and Ken. 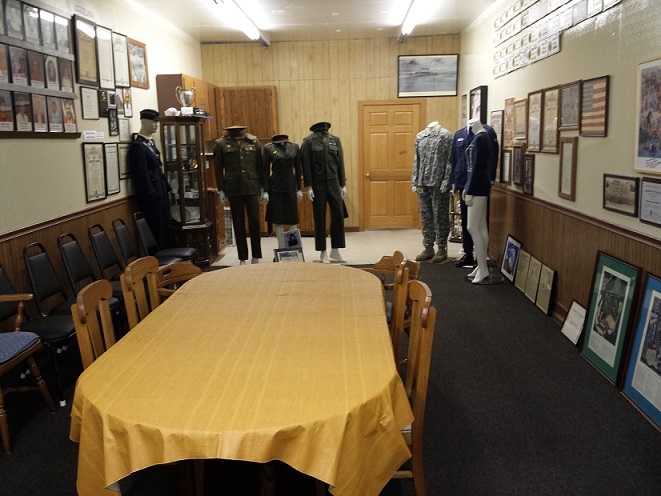 This work has added a final finishing quality touch in the work to make this room an excellent place to learn the history of our Post and the service that our Auxiliary members provide. Keith & Jerry installing the last new ceiling tile in Post 501’s Auxiliary & History Room. Well done fellas. 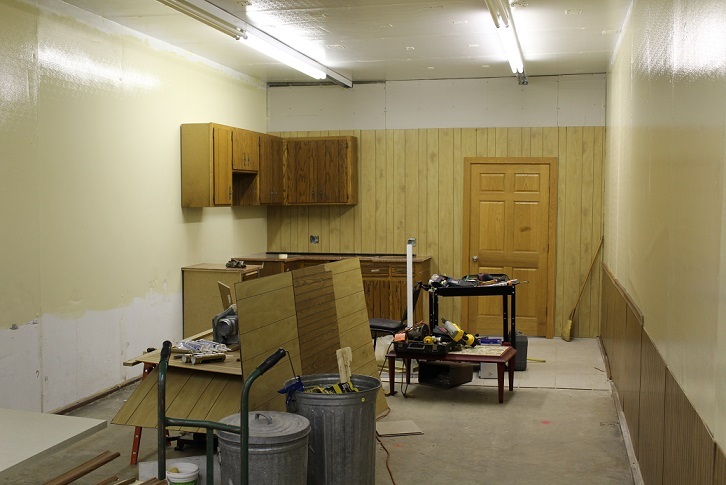 Below is a historical photo summary the work in progress on the Post 501 History Auxiliary Room, which you can now see the results of their labor. 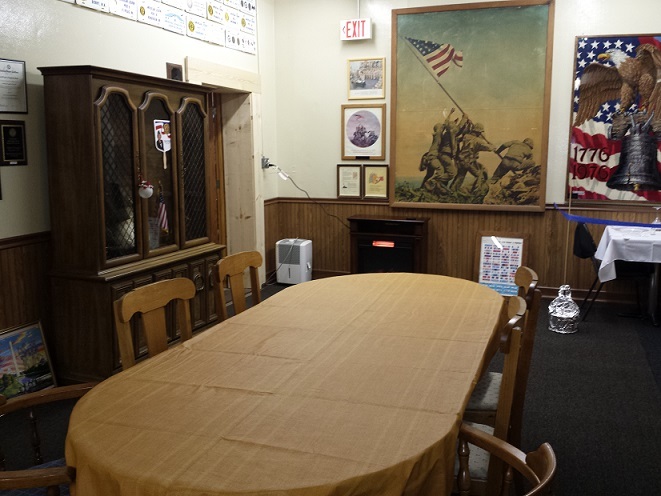 Other than the planned drop ceiling with recessed lighting, and a few more electrical outlets, this new room is now serving its purpose of exhibiting the history of the Legion Post 501. Our loyal Auxiliary members gladly now fill the conference table to continue their plans in support of our combined mission. 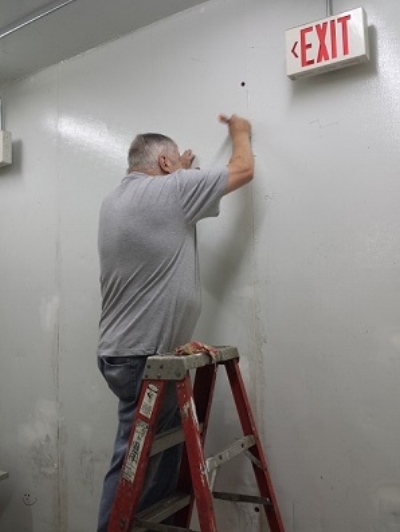 Jerry preparing the Post 501 History/Auxiliary meeting room wall for painting, 6/29/2017. Rich setting tiles in the Post 501 History/Auxiliary meeting room, 6/29/2017. History/Auxiliary meeting room storage cupboards are installed, 7/24/2017. History/Auxiliary meeting room wainscotting installation in progress, 7/24/2017. Construction Team sharing ideas, 7/24/2017. Construction Team, Legionnaires Cdr. Tom Stolarczyk, Bill Robbins, Mike Rhodes, Jerry Schultz, Rich Ruland, 7/31/2017. Legionnaire Chris Robbins painting photo rails for displaying Auxiliary Unit 501's leadership photos, 8-18-2017. Finished room, dropped ceiling still needed. Long view towards room front. Ceiling & lighting is now complete. View of new ceiling & lighting, looking to the room front. 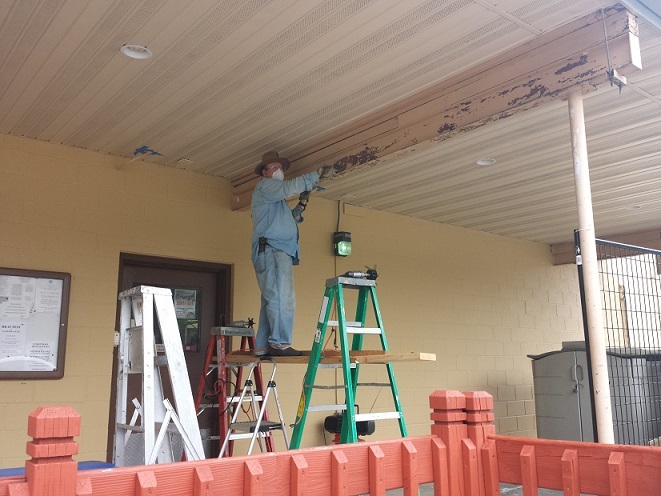 Fellow Legionnaires, our American Legion Post 501 still needs work on a substantial number of projects, some currently ongoing, to improve the quality of our Post. As you can see by some of the projects already completed, a ton of work has been accomplished, a lot of funding has come in, needed to bring this Post 501 clubhouse up to very useful standards. 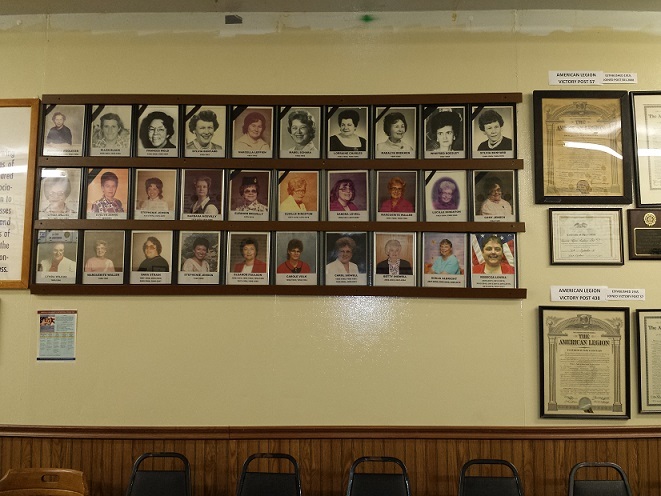 What is needed now is person power (PP) for some of the remaining projects - that is to say, folks willing to provide of their valuable personal time to roll up their sleeves and get to work in installation. Many of our Legionnaires, due to age or physical abilities, are unable to provide the hours at labor. However, that does not prevent them from becoming highly valued members. Remember - we suggest options - either a "Dollar" or an "Hour". We figure that one hour of physical labor is worth $10 in cash donations. We are fortunate to have a Legionnaire, Rick Bressett, here in Post 501, who has donated the equivalent of 70 hours of labor. In addition, Rick invested, in 2018, an additional 50 hours of labor equivalent to $. Those funds which Rick so generously provided has and will still allow us to complete some of the financial aspects of the projects listed above. We thank him! We will continue to update this section of our website in the near term, as further progress ensues. The Legionnaires of Post 501 also want to pay a special thanks to our Auxiliary members who so generously provided, out of their own limited budget, a substantial amount of funding which has allowed this renovation to proceed. What Post 501 still needs now "are hands on deck" for manual labor. To wrap things up, we just want to say again that some of the work can be done on a weekend, and other projects can be partially completed during workdays. The Post 501 House Committee is responsible for establishing the project dates and times (TBD) and these will be published on this website's calendar as decisions are made. If you can devote an hour or two of your time, please let us know – use the “Contact US” page of this website as a starting point. If you would be willing to assist in any way, just let us know of a day and time that you would be available. If you leave your phone number, we will get back to you as soon as possible for follow up and coordination.